Note: this analysis has been undated in a four post sequence starting here. One can read the next post by following a link at the end of the one before. This post will show the extent to which the state and local taxes people pay are being sucked into the past, rather than being used for any current public services or benefits at all. The tables in this spreadsheet include 1972 to 2012 data for every state, and for New York City and the rest of New York State separately, on state and local government debts, past infrastructure and education capital construction expenditures, and pension funding levels and taxpayer and employee contributions, pension benefit payments, and pension assets. Warning: with data for 50 states-plus over 30 years plus for lots of data items and lots of tables and charts, it is large. This information is summarized in a series of tables one can examine by clicking at the tabs at the bottom of the spreadsheet. The charts used in this post and the next two follow to the right. And rather than bury the lead to force people to read all the details, as usual, I’m going to discuss the final conclusion – the sold out future ranking — up front. 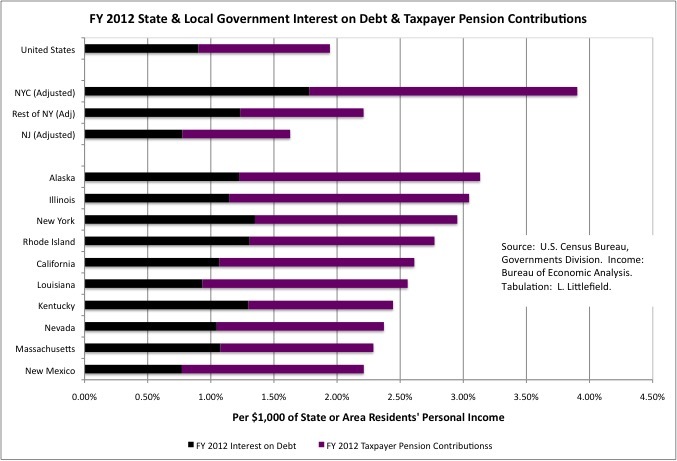 In FY 2012, according to public finance data from the Census of Governments and personal income data from the U.S. Bureau of Economic Analysis, total state and local government debts equaled 21.2% of U.S. residents’ 2012 total personal income. The debt total was about $2.94 trillion. The annual interest on that debt equaled 0.9% of personal income, meaning U.S. residents paid $9 in state and local government taxes for each $1,000 their household earned just for interest, with no state and local government services in return. If U.S. state and local governments had continued to spending as much on infrastructure construction investments from 1980 to 2012, as a percent of the income of U.S. residents each year, as was spent from 1977 to 1981, before a slowdown, they would have spent an additional $807 billion (adjusted for inflation in $2012) on infrastructure construction over 30 years. 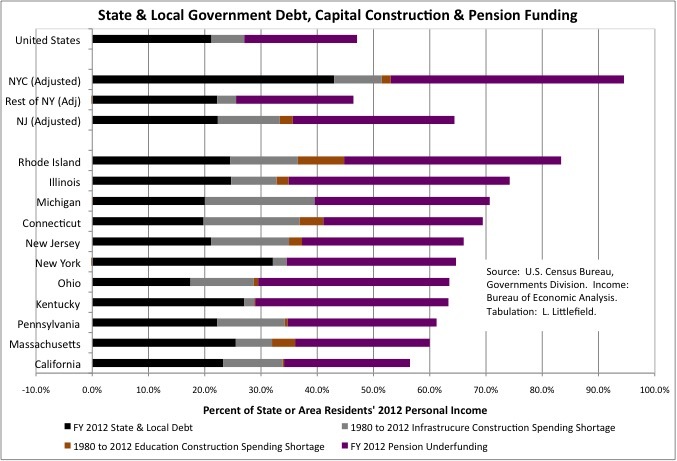 That hidden “infrastructure debt” equaled 5.8% of the personal income of all U.S. residents in 2012. 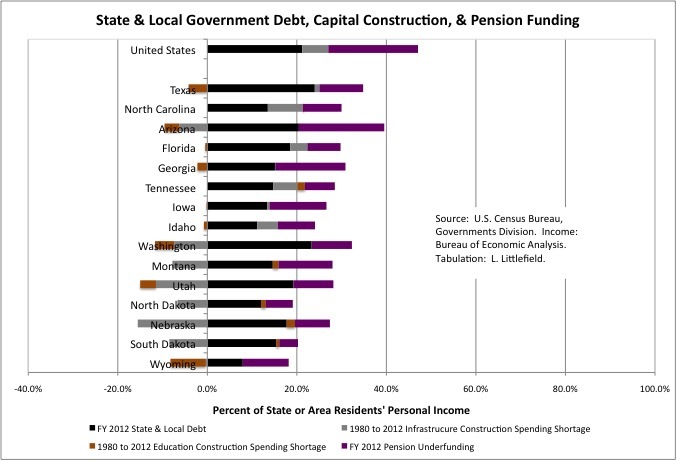 And while the level of capital construction investment in education buildings seems appropriate nationwide, some places have a deficit in that category too. Other states where older generations have most victimized those coming after include (in order from the worst) Illinois, with a burden of 74.2% of that state’s residents’ personal income in 2012, Michigan at 70.6%, Connecticut at 69.4%, Ohio at 63.5%, Kentucky at 63.3%, Pennsylvania at 61.2%, Massachusetts at 60.0%, and California at 56.5%. While California makes the top ten most sold out states, it is only 20.0% worse off than the U.S. average, hardly a disaster compared with the other states on this list. Except, of course, that the U.S. average is itself a disaster. A Tea Partier might note that most of these states are Democratic leaning, at least at the state and local government level, and are or were heavily unionized. As someone who has followed state and local government for most of the past 30 years, however, I can tell you that many of the deals to run up debts, disinvest in the infrastructure, underfund pensions and retroactively increase them were made, or at least signed off on, by Republican Governors and Mayors. If the Republican goal has been to make government such a bad value, and so unjust for the less well off and younger and future generations, that even those with an egalitarian frame of mind give up on it, I can say that at least in my case they have made great progress. And evidently not just in my case. Because even though Republican politicians and interest groups are just as guilty, and at the federal level more guilty, of selling out the future, the resulting outrage at tax increases and cuts in public services has seen the Democrats run out of statehouses across the country. This entry was posted in generation greed, generational equity, Uncategorized and tagged census of governments, generational equity, government debt, infrastructure investment, local fiscal crisis, public employee pension, state fiscal crisis on June 24, 2015 by larrylittlefield.